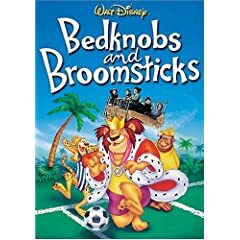 Bedknobs and Broomsticks is a 1971 Walt Disney fantasy movie, starring Angela Lansbury as Miss Price, David Tomlinson as Professor Emelius Browne, Roddy McDowell as the Father Jelk and three unknown young actors as the children Carrie (Cindy O'Callaghan), Charles (Ian Weighill) and Paul Rollins (Roy Snart). The film follows three orphans, their temporary caretaker Miss Price, and her teacher Professor Browne on a series of fantastic adventures, with the aid of her magical abilities. Buy it on VHS, or DVD. The children tell Miss Price about how their only guardian, their aunt, was recently killed in a bombing raid. Their supper that night is a rather unusual assortment of "witchy" sounding foods. That might be because Miss Price has a secret. She has been studying witchcraft through a correspondence course, and already has a black cat as her "familiar". Now she has just gotten her first broomstick. Watch it on Youtube Part 2. After a few false starts, Miss Price goes on her maiden flight. Meanwhile the children have decided to run away, back to London. They accidently spy Miss Price flying about, and the eldest thinks he might be able to blackmail her. He pushes her too far however, and she turns him into a white rabbit. Since she is only an apprentice, the spell wears off quickly. They make an arrangement and seal it with a gift of an enchanted bedknob, that can make you travel anywhere you want to go, on a magic bed. Watch it on Youtube Part 3. Now Father Jelk shows up wanting to pay a call on Miss Price, but she shuts him out. She is more interested in going to London to see Professor Brown, for her final spell. She must go immediately, so they will use the traveling bed. Now Miss Price sings! Then Miss Price and the three children all go flying in the magic bed to London. Watch it on Youtube Part 4. They appear in London, in an alley, as it turns out that Professor Emelius Browne is a humbug, doing magicians tricks in the streets, never realizing that the magic he has been sending to Miss Price is actually working. Now he sings as he does various tricks. He declines to give her the last spell, and so she changes him into a rabbit for a few seconds. He is amazed but delighted to have met a real witch, able to use his spells which don't work for him. Part 5. They then all go, on the bed, to "his townhouse", which really belongs to someone else who has temporarily abandoned it because there is an un-exploded shell in the front yard. Here they have dinner and Paul finds the cartoon-book The Isle of Naboombu. The Professor tries to convince Miss Price to join him on the theatrical stage. He sings again, while she hunts around trying to find that "old book" from which he got the spells he sent her. Professor Brown acts so flippant, singing and dancing her about, that she again turns him into a white rabbit. Part 6. They finally find the book and it's titled The Spells of Astoroth. But the end of the book, which she thinks has her missing spell of substitury locomotion is missing! Now to find the missing half of the book they go to Portobello Road where all the vendors of rare treasures are, including booksellers. While she hunts around the vendors for the book, the Professor sings and plays piano, and there's a great deal of dancing about by various people. Mostly quite silly. Part 7. There's a bunch more dancing about. The vendors all close-up shop and then the sinister-looking fellow pulls a knife on our group. They are ordered to go see "The Bookman" (Sam Jeffe). He, it turns out, has the other half of the book, but when they exchange their halves they discover the magical spell is not actually in the book. But the book tells that the spell is on a magical Star of Astoroth which is missing. Astoroth it turns out kept animals, which eventually rebelled against him, took a ship and sailed to the Isle of Naboombu, evidently taking the star-medallion with them. The Bookman threatens Paul to try to get him to give-up this book, but instead they all escape on the traveling bed. Part 8. Now our party arrives on the Isle of Naboombu. Or rather they plunge into the lagoon next to it. For this part of the movie, everything except them is now rendered as cartoon. Now underwater, but able to breathe it anyway, they meet a talking cartoon-fish. Now we get another song from the Professor. And a lot of antics from cartoon sea-creatures. And then Miss Price and the Professor dance together again, and win a trophy. A big hook comes down, grabs the bed and pulls the whole group to the surface. The fisherman turns out to be a talking cartoon-bear. They insist that they have to see the King, who turns out to be a cartoon-lion in a very bad temper. Part 9. The King is royally upset because the soccer match cannot take place that day, because there is no referee. Professor Brown volunteers. As they talk, he notices that the star medallion is on a ribbon around this king's neck. Then begins a rather one-sided soccer match one team being composed of nasty, aggressive, toothy animals, and the other side, being meek, gentle animals. As the game proceeds, we learn that the lack of referees is because of the physical abuse they take from both sides. (The medics are cartoon vultures.) The ball is punctured and goes flying off. The Lion very upset, lets out a roar which knocks all the other players into the goal, the ball floats down and he blows it into the goal as well. So his side wins 1 to nothing. Part 10. While the Professor is helping the King on with his robe, the Professor pulls a switch exchanging his referee's whistle for the King's medallion star, which he hands behind his back to Miss Price. Our group then hurries back to the bed, while the Lion just realizes that the star is missing. He rushes after them, but Miss Price turns him into a white rabbit. They then return to her country home, where she wishes to experiment with the spell by casting it on the Professor's empty shoes. But the star with the magic words on it has vanished. The Professor now goes for provisions at the village, where the postmistress pries and tries to give him a push to marry Miss Price. At this time Father Jelk walks in, overhearing the end of this exchange, and is jealous. The postmistress takes some glee in needling Father Jelk about it. Now it turns out the missing magical words were in Paul's cartoon book all the time. But when she tries them, they don't work. The missing part is that the Professor had been switching things about with the other spells, so he tries here as well. And we get another rather silly song. Then the shoes start dancing by themselves. Part 11. But the last train for London has already left. Meanwhile, the Nazis have landed in small boats along the coast, and takes Miss Price and the children prisoner. Professor Browne, waiting all night at the train station, has second thoughts and decides to return to Miss Price. Finding them prisoner, he evades capture himself, by turning himself into a rabbit, the first time a spell by him has worked. They are all reunited, in their makeshift prison, the museum of arms. Part 13.